The global demand for tropical fruit juices has been increasing for the past few years. Sweet aromatic taste of mango is the major factor driving the growth of mango fruit juice market. Rising health concerns and amount of nutrition in fruit juices successfully influenced the growth of mango juice market. Europe is the major consumer of fruit juices which comprises more than 20% consumption of mango juice in Europe of which more than 50% consumed in United Kingdom. Countries in Asia, South America and Africa are the major producer of mango and major exporters to North America and Europe. Major producers are responsible for more than 90% domestic consumption. Mango beverages are one of the fastest growing fruit juice categories, which are outpacing the carbonated drinks in terms of volume growth. Mango Fruit juices are majorly known for its taste and acquire largest market in Asian countries such as China, India and Indonesia. Market players such coca cola and PepsiCo are continuously expending huge amount on advertisements and product line of mango juices in Asia. In 2016, carbonated drink market in Asia has grown by 27% in volume sales, but juice segment that have up to 25% fresh juice content has grown by 63% over the same period. Rising health awareness and growing popularity of tropical fruits are the major factors driving the growth of mango juice market. The industrial demand for tropical fruits and mangoes are growing quickly owing to response from consumer demand for indigenous and non-indigenous fruits. Global production of mango has grown significantly in recent years and surpassed 45 million tones of production in 2015. Growing disposable income and product innovation are some of the other factors which have significantly accelerated the sales of mango fruit juice. Demand for mango concentrates in North-America and Europe are growing significantly owing to rising demand for fruit juices and concentrates in western countries. However, rising logistic costs and being a tropical fruit, mango is quite a costly fruit in regions of Europe and North-America, which is expected to saturate the growth of mango juice in some markets. 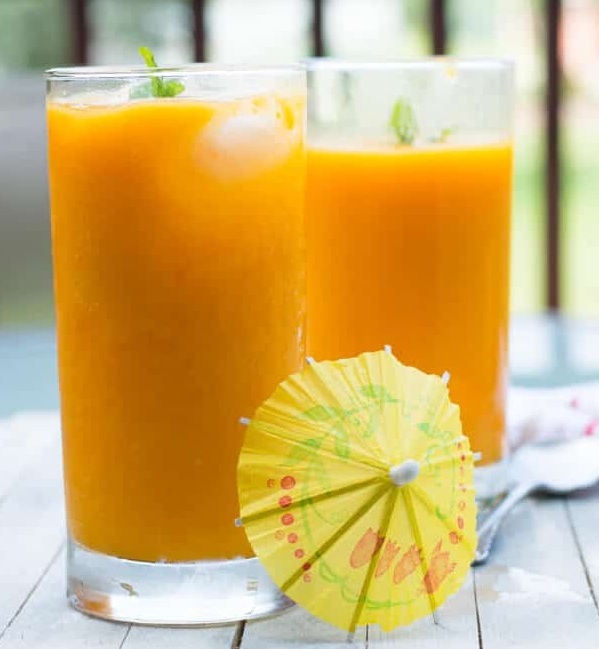 The global mango juice market is anticipated to reach USD 22.1 billion by the end of 2024, expanding at a compound annual growth rate of 4.1% over the forecast period i.e. 2016-2024. The global mango juice market accounted for over USD 16.0 billion in 2016 owing to health awareness among consumers. Asia-Pacific region is expected to witness fastest growth and dominate the global mango juice market. By the end of 2024, Asia-pacific region is projected to surpass USD 9.4 billion backed up by the rising sales in India, Thailand, Indonesia and China. Asia-Pacific is closely followed by Europe with more than 20% of mango juice consumption of total consumption in Europe. U.K is expected to dominate the Europe region with more than 50% consumption of mango juice in this region. North-America Juice market is growing significantly on the back of rising number of migration from Asian countries and their preference for food and beverages is expected to drive the growth of mango juice market in North-America.